Wouldn't it be wonderful if you never had to worry about germs crawling around on your kitchen countertop? Well, thanks to a new discovery by Australian scientists, that could soon be a reality. And it doesn't require a drop of disinfectant. It's called black silicon. While the material itself was discovered back in the 1990s by some Harvard guys, scientists only recently stumbled across its antibacterial properties after studying the wings of cicadas and dragonflies. They discovered that nanostructures shaped like little pillars on the wings effectively shreds and kills any bacteria that tried to settle there. 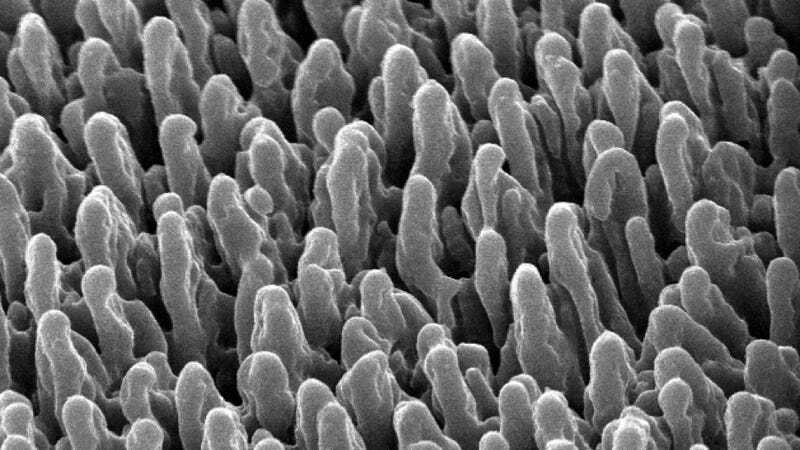 With spikes that are just 500 nanometers high, black silicon (pictured above) has the same property. Bacteria literally can't land on the surface without being destroyed by the spikes.